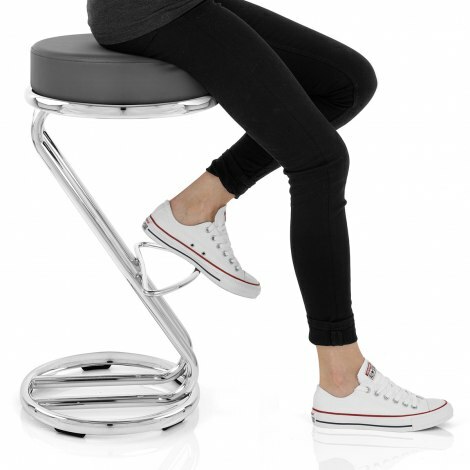 An eye-catching and iconic design, the Zizi Kitchen Stool Grey brings a classic yet contemporary look to your interior. The classic z-shape frame gives this stool its famed style, meaning the Zizi Kitchen Stool is guaranteed to be a centrepiece in your interior. 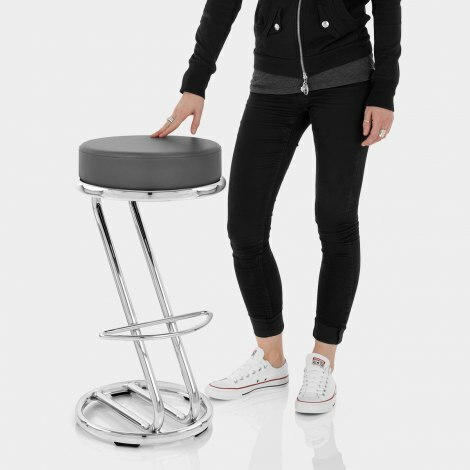 The seat is upholstered in grey faux leather and has a padded round design, which is accompanied by a matching round base at the bottom of the frame. Sporting a distinctive z-shaped frame, this fixed height backless piece will fit nicely underneath the kitchen worktop. Plus, the chrome-plated finish complements modern kitchen appliances. A semi-circular footrest completes the look and aids in support, whilst height adjustable protective feet work to take care of your floors. "Perfect for tucking under the counter top"
Fantastic value at £45 each. Sturdy and v good looking. Bought two. Would recommend and buy again. Just received my grey stools. So pleased with them, even though it was bank holiday, I didn’t expect them today. I would recommend them any day. Perfect for tucking under the counter top. Smart chrome and grey which goes with most schemes. Classic design. Great, just what I needed, exactly as advertised good quality.